How To Get There: Car via Cancun. Soundtrack: Rodrigo y Gabriella, Calexico, Groupo Fantasma. Best For: Namaste, zen retreats, beach vibes. Tips: Limited pluming in southern places near jungle. Attire: Leather sandals, embroidered top, lace swim wear. When we were looking for a place to escape inauguration it was a bit of a challenge to find somewhere that met all of our criteria: 1. Out of the America, 2. Affordable 3. Accessible and 4. A mix of relaxation and adventure. Since it always ends up being a longer day than anticipated with international travel (between getting to the airport earlier and going through customs) we didn’t want to spend half of it in transit for a long weekend. Therefore we narrowed our options down to Canada and Mexico. And with it being January, we didn’t want to go anywhere colder than DC in the winter. So Mexico it was, ole! I began to research places, yet everything on the beach was too touristy for our taste and anything more inland would require far more logistics for this particular trip (although Mexico City is definitely on the top of my list now!). So I zoomed out further from the major cities and that’s how I discovered Tulum (which is often how I find the best destinations). 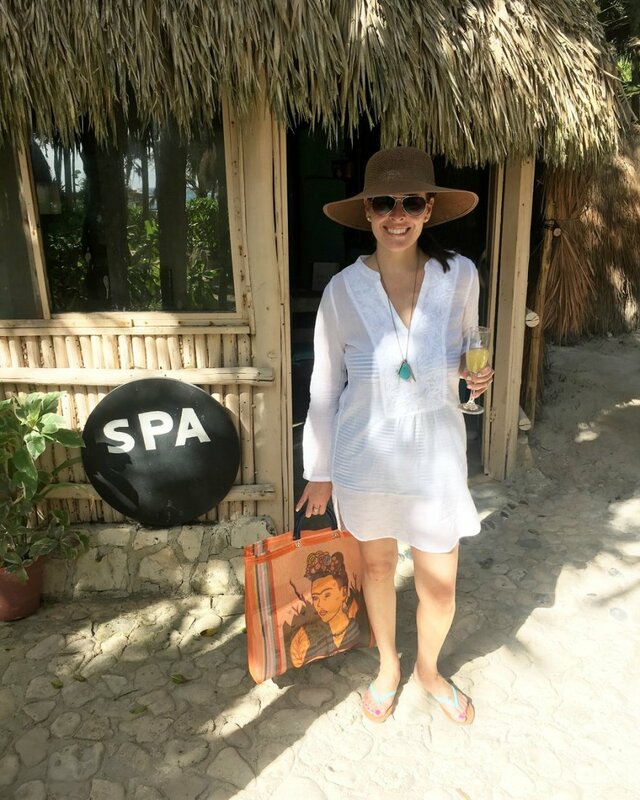 I quickly realized that Tulum was the whole enchilada…and then some! 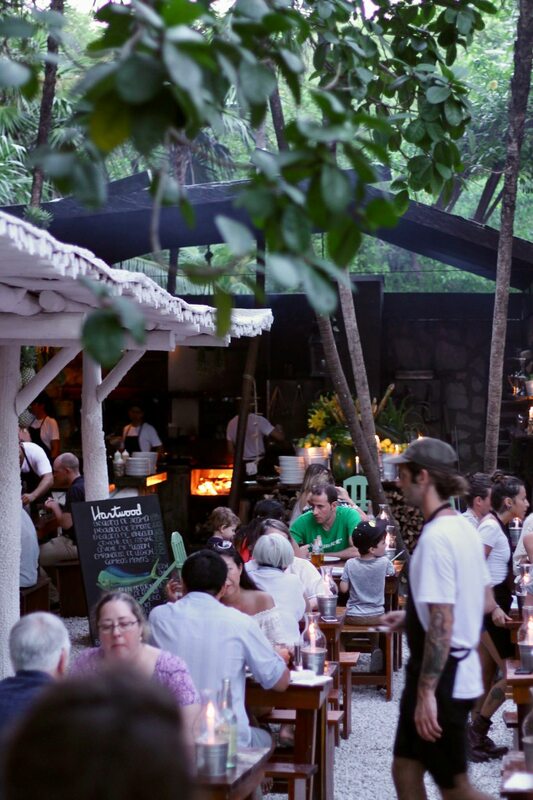 Part Mayan ruins, part jungle, meets crystal blue water all with a laid-back vibe, sustainable living and as many organic restaurants, juice bars and yoga you can possibly pack into a few mile stretch. Far enough off the beaten path that it’s not congested with tourists, yet it’s relatively convenient to get to. Just take the main highway from the Cancun airport about 90 minutes south, hang a left at the light (below) go less than a mile and you are there! A bike-path lined, barely paved road (that has just enough room for one car to squeeze by each direction) goes about 4 miles from where Tulum begins (at the stoplight) and dead ends at the Sian-Ka’an reserve national park. Along the way are dozens of bungalow-style hotels nestled in, side by side each with its own security guarding the entrance (as parking and space is at a premium and to keep the beaches private from outside guests). 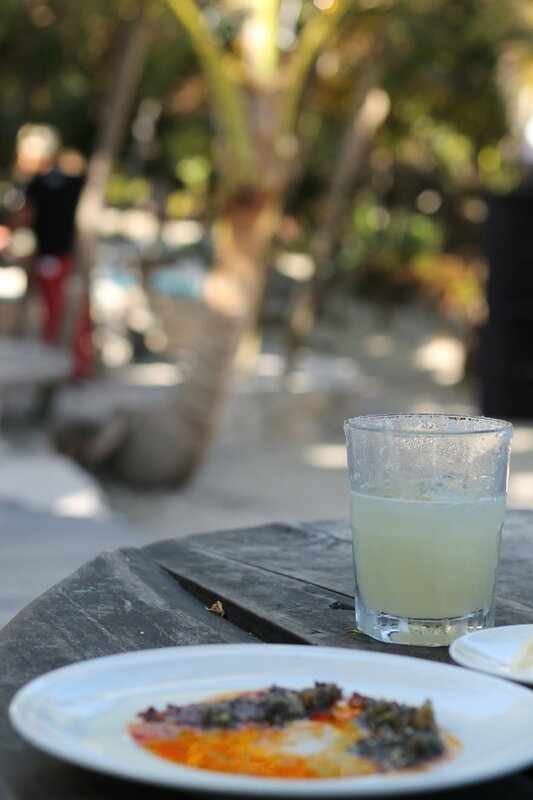 The best thing about Tulum (in my opinion) is how un-commercialized everything is (which goes for hotels too). Places to stay are bungalows at best and most are independently run (sorry you can’t use your reward points here). 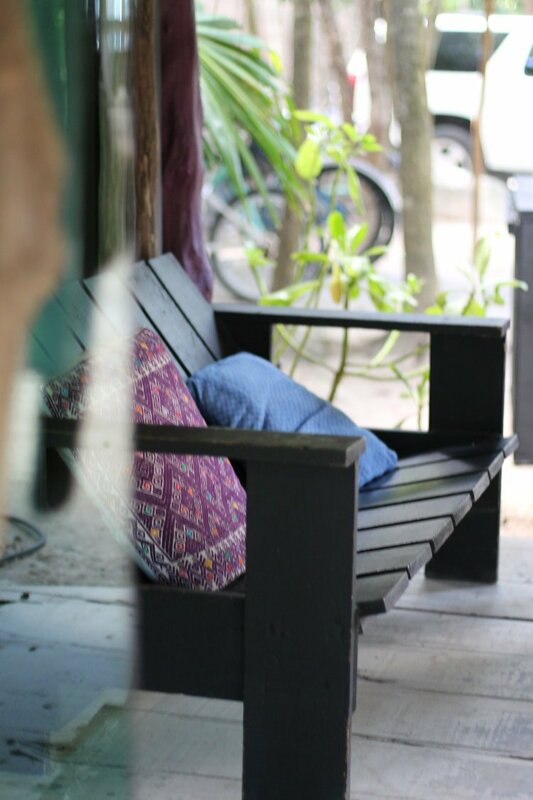 A mix of upscale boutiques, mixed in with a few hostels and meditation retreats each with its own eclectic feel while being tucked away along the jungle filled path. We initially planned to stay at Nest (on the most southern end of the 4 mile stretch) but glad we didn’t end up there because it’s much further away from most of the action (and the closer south towards the jungle you get, the less infrastructure there is). There are also a pocket of hotels in Tulum’s “city” center but they’re about a 5 minute (or 20 minute bike ride) from the water. And you can only access the beach through a semi-public beach club, so well worth the premium to stay on the ocean. As we entered through the gate off the main road I could have sworn we were arriving at a Woodstock campground instead of a hotel: a gravel filled parking lot full of run down colorfully painted VW vehicles, large-scale murals and wandering pets. We arrived at our “room” and were pleasantly surprised to see we had our very own hut. And so grateful to see a view of the glistening beach peeking through the palms like a beacon (that was so highly anticipated after 2 months of planning and 12 hours of traveling!). 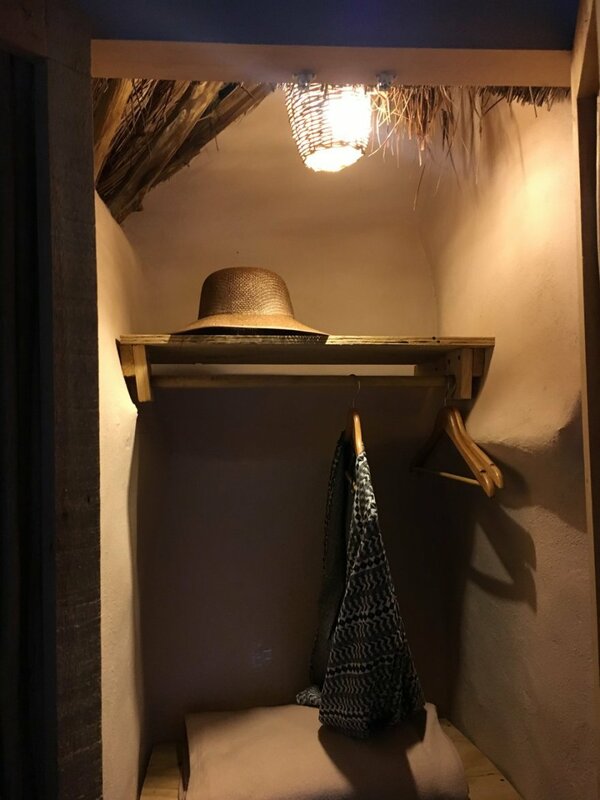 My husband and I looked at each other in equal parts shock and excitement for the fact we would be sleeping in the equivalent of a treehouse for the next 4 days complete with mosquito net bed, straw roof and personal hammock (my idea of “glamp-ing”). After we waited for our bags to arrive (in a hammock outside the room) we quickly unloaded our stuff and headed straight to the beach bar where there are benches carved into the rock all with views overlooking the water. There’s also a couple covered areas upstairs, but why would you sit there when you can be out in the open? Having not eaten all day, we were starving and didn’t care if we couldn’t understand the menu: everything sounded delicious! 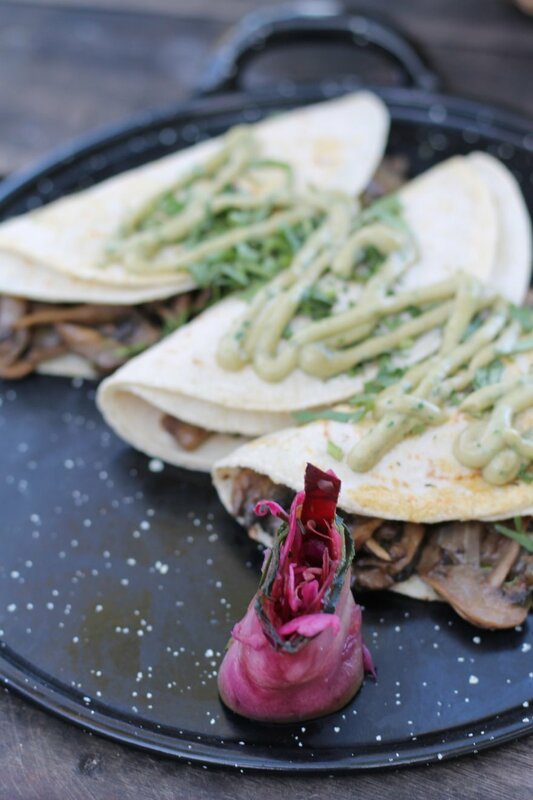 We ended up splitting mushroom tacos and chips and dips. But our own margaritas of course! NOTE: they don’t skimp on their guac like they do in the states. A side portion is the size of an entire entree! 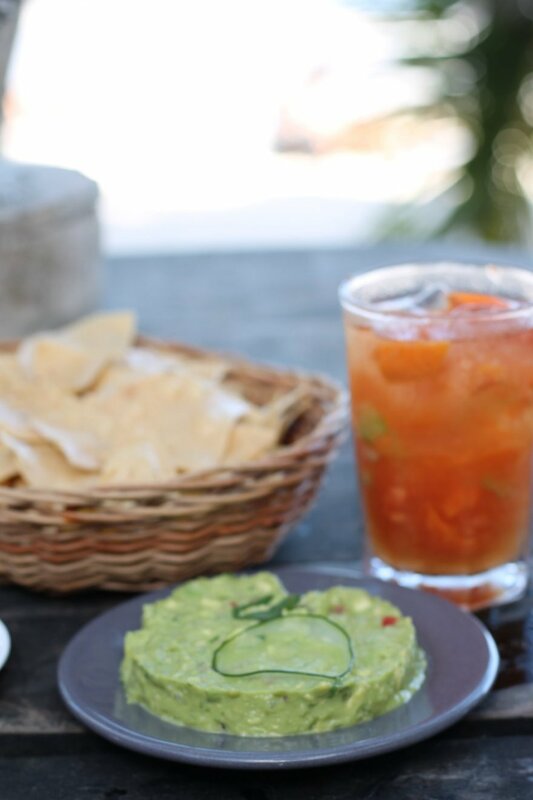 And given my husband doesn’t eat avocados I was one happy (and stuffed) camper in Mexico. The PPP has all the basic amenities you’d come to expect from a mid-sized hotel (beach side waiter service, bike rentals, fresh juice bar, spa services and daily sunrise yoga) yet you feel like you’re alone in paradise with nothing except for you and the crashing waves. If you don’t want to leave the PPP, it’s alright with me! There are plenty of lounging beds with full-service food and drinks delivered to your cabana – hello Micheladas! There’s even an outdoor “living room” area where you can go escape from the sun, plug in your phone and catch a breeze. The PPP is stumbling distance to a little pocket of local restaurants and tiendas (shops). The first night we had appetizers and a drink at Mateo’s which was clearly the happening place to be with a packed house and live band. Then ventured across the street to Mina for a more quiet atmosphere with string lights and an open fire kitchen for dinner. The next morning we took advantage of the breakfast buffet at the PPP and had beachside breakfast tacos and mango mimosas. Then later that night drove down towards the other end of the Tulum to eat at the infamous Hartwood (with pre-dinner cocktails at Gitano). We made reservations weeks in advance but still ended up waiting over an hour for out table but it was well worth the wait. But even the less trendy, dive-y spots are just as delicious including the Mexican restaurant next door to Mateo’s (that also had live music) Sin Yolanda and the most amazing burrito I’ve ever had at a roadside Burrito Amor (in downtown) complete with mariachi band and fresh guac and margaritas. When we returned back from dinner the last night we came to find out that the outdoor hotel restaurant turns into a dance club with a DJ (on some nights of the week) but was a pretty chill vibe since it’s only open to hotel guests. Speaking of hotel, I should also mention the PP has another bar, the Palapa Union that is on the street side that’s open to the public. We didn’t ever make it there (just cut through to get out of the hotel) but they had their own brand of Mezcal and every time we passed by I was tempted to try. And about half way back to Playa Del Carmen we stopped to have brunch at Hotel Esencia a luxury, boutique hotel but their poolside restaurant on the beach is open to non-guests and a great way to see the property without staying there (although it was a bit of a hike since we had to valet our car, take a golf cart and walk for about 10 minutes down a path to get to). 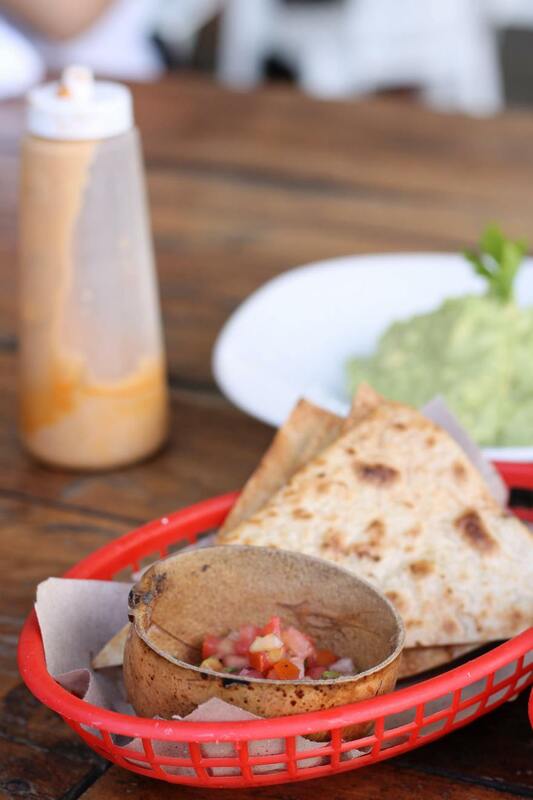 You really can’t go wrong with food in Tulum. In fact, American Airlines recently did a big feature about the foodie culture there which I highly recommend checking out to read more about the cuisine scene. Beside relax, eat and drink? 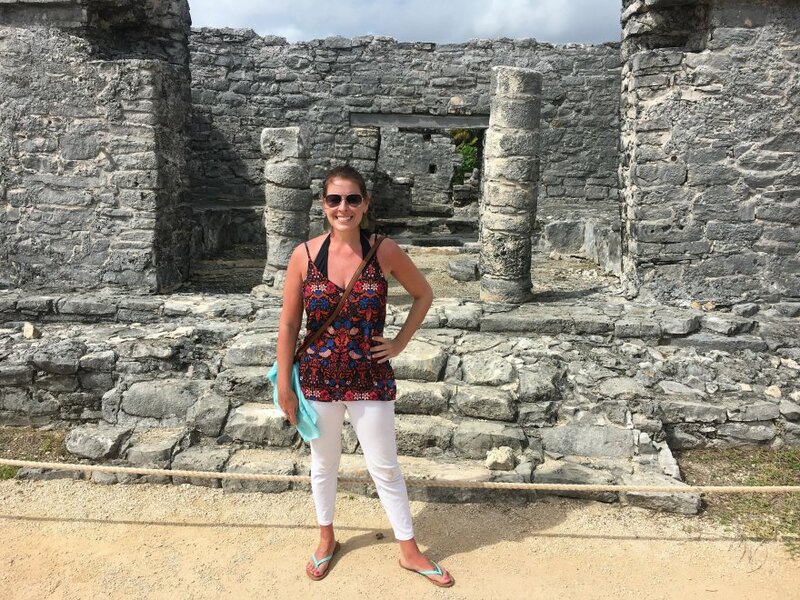 See the Cenotes, do yoga and the Mayan ruins (we did all three). 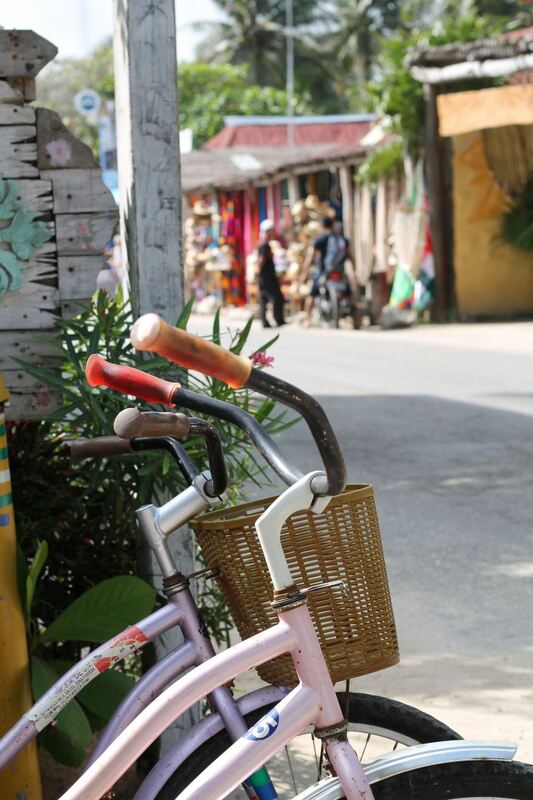 You can rent bikes although they’re one-gear, pedal break bikes so don’t expect to go super long distances on them. And be sure to stop in one of the many open-air boutiques and browse the Mexican art, jewelry, and clothes. 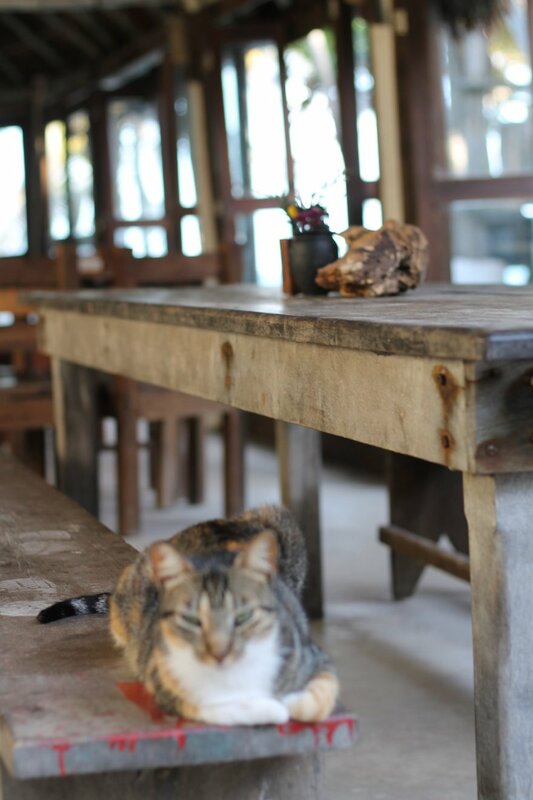 Now I see why Tulum has become such a destination and cultural hot spot: it’s a hippy heaven! And the perfect place to escape the DC drama and inauguration madness for a little namaste, relaxation and lots of Mexican Tequilla!